An intense fight is being waged over brand America. While personal views certainly play a role, America’s top CEOs see something much bigger at stake: Should brand America shift toward what some of them refer to as moral ambiguity, or should it stay like it was before Donald Trump was elected? The CEOs appointed by President Trump to the Strategic and Policy Forum and the Manufacturing Jobs Initiative made a dramatic decision yesterday. They simultaneously decided to disband. The CEO’s comments about the events in Charlottesville and their responses to President Trump’s Tweets and press conferences (see table below), indicate that personal values were not the only thing at stake. These CEOs repeatedly emphasized values their companies strive to uphold. They made a strong yet implicit declaration: Brand America must be associated with the moral high ground it has sought to maintain since its founding. 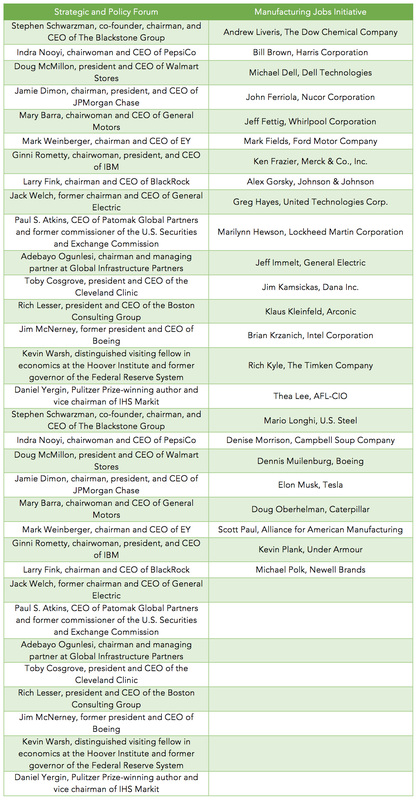 These CEOs are not happy with and cannot support the morally ambiguous direction that President Trump is taking. In the 1990s it was popular for companies to be “customer centric.” This philosophy often became an explicit component of the brand image conveyed in marketing programs. Today, company brands are increasingly concerned about nurturing, demonstrating, and advocating key moral values. They are now critical to brand success. This was never more apparent than what we just witnessed over the last few days. These CEOs decided to not tarnish their brands through association with the values espoused by President Trump. Even further, it seems they think President Trump’s moral ambiguity is diluting America’s brand, which subsequently devalues their brands. The following table provides published statements from members of the two defunct Presidential advisory councils. For contrast, select statements from President Trump over the same timeframe are provided. The subsequent table provides a list of the members of the two councils. The CEOs of our nation’s iconic brands are stepping up to protect Brand USA. Perhaps they decided to take a more active role in nation-branding.